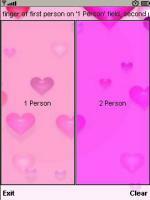 Fingerprint Love Test checks how well two people match together. The result is calculated basing on persons fingerprints. A sophisticated algorithm then finds the similarities and calculates a score how well the two persons match together.